Sunset couldn't help but find herself amused by the pair - Twilight, who was still getting used to actually trying in social situations - and that much was easy to see by the awkward way she held up when it came to a casual but unexpected conversation...and Inkbrand, who was definitely no slouch in the socializing side of things as a whole. Ordinarily, this wouldn't really be a problem...but this situation was far from ordinary as far as Twilight went, seeing as she was not exactly familiar with the 'rogue' charms of the mischievous male currently relaxing calmly within earshot. Sunset had no true quarrels with him, of course, but when it came to the inexperienced Twi Sparkle, she wasn't really certain that her current level of 'experience' around others in a more direct capacity would keep her from getting into something she hadn't originally intended. But no, she wasn't here to make any big social rescue, but to simply provide a familiar face for a while if she needed any. " It's fine, Twi - I just wanted to come by and hang for a bit... " she states with a small nod. " The others are a little busy right now and I figured that you might appreciate a little assist if you needed any...plus lunch is always a little better with a friend around to kill time with, it's not nearly as enjoyable on your own. Heck, if Inkbrand wanted to join, he's more than welcome to if he's got nothing better going on! " Sure she was mostly having a little fun with Ink on that, but Sunset didn't really mind, and she was fairly sure that Twilight could decide for herself if she wanted anyone around her at all right now. It was, for the most part, just Sunsets attempt to give Twi' an option to have people around at lunch for casual school exploration, conversation, and whatever else might well come with it! Sunset paused to think on anything that had occured as of late that wasn't entirely magic related...honestly, despite whatever silliness surrounded pinkie whenever she appeared, Sunset really couldn't remember anything overly obvious that had been going on, and there wasn't much that had been brought to her attention that could be related to the incidents being reported. Frankly, she was a little bemused that anything was even going on at all as everything had been so overly 'calm' lately in relative comparison to what had taken place in CHS since she'd been there - still, if there was something that needed to be looked into then she wasn't about to shirk that particular duty. " Hmm, sounds like we need to keep ears to the ground and find something tangible. " Sunset ponders aloud, glancing at the others a moment. " If Valen has gotten himself caught up in something we don't know about, it might do good to find if there's been any change in his routine from his friends...maybe somebody who knows him closelly will also have noticed anything unusual in his behaviour! " She didn't wanna think there was something up with one of CP's transfer students but if there was potentially anything linking them to what was apparently taking place, then they needed to really get to grips with the details and look more into the who's and why's of the scenario. Valen had struck her as one of the more interesting but mature students who'd crossed over from Crystal Prep, so to think that he might be involved in something underhanded was a very weird thing to consider...but at the same time, if there was any reasons to believe he had a motivation to carry something out then she couldn't rule that out either. Whatever was going on certainly was a curiosity, and Sunset was definitely intrigued to see just what was really happening with all of this! It was the end of the day, and Sunset had found herself a little curious about the text received about the possibility of Something going on at both Canterlot High and Crystal Prep - there was a complete lack of any real details outside the original text that Sugarcoat had sent, and that was a little bothersome. At any rate, Sunset needed to get to SCC to meet up with Sugarcoat - if there was any chance that they could figure this thing out, then she was all for it...granted it wasn't like Sunset had any ideas what this might have been pertaining to herself, but if Sugarcoat knew anything more about what was going on and the names of those responsible, that would no doubt help get things rolling. Pushing the doors open, she could see a small influx of students already here...some were mostly just doing their afterschool recovery, the weary looks on their faces pretty much evident of that particular fact as they sat slumped in their seat attacking whatever manner of snack and drink they had before them. She could also see Sugarcoat and Applejack, whom she waves to as she approaches the table of the pair - the other girl, watermelon, had just arrived moments ago and was attempting to introduce herself but was seemingly not doing particularly well in doing so. She decides to take her seat quickly, so as not to interrupt TOO greatly - it seemed as though poor watermelon gush was really having a hard time expressing her greetings and Sunset didn't really wanna get in the way of her doing that if she could help it...deciding to peruse the menu for something whilst the others got their meets and greets out of the way. Election woes? We'll always have Equestria...and there ain't no walls around that! Lunchtime, and Sunset was in the middle of devouring a particularly delicious sammich when she noted the entrance of one Twilight Sparkle, freshly enrolled and looking a little lost in the cafeteria crowd...and given the circumstances, she wasn't about to miss out on this worlds Twilights integration with the school. Considering that she'd been part of one of the largest magically-saving friendship experiences of anyone else Sunset had known save for herself, it was kind of a big deal that she didn't simply skip out on being around to give her friend a warm welcome to CHS properly. This time, without any of the flashy unpredictable magic that had accompanied things during the friendship games - that had kinda spoiled the mood. Well, she hoped so at least...there was no real way of knowing how that would turn out. Still, today was about making sure that Twilight felt the same as she had when she'd left the school a couple of days ago - surrounded by those who knew she was a good person and that she was somebody who could pretty much do whatever she wanted from this point on...even if that something she wanted was mostly just to hang around her own personal labspace and research life, the universe and everything. 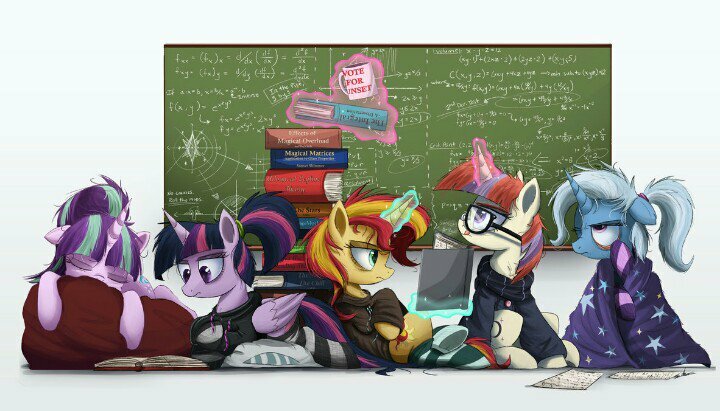 Sunset had a brief pang of relatability to that particular feeling, as a part of her still loved and enjoyed the pursuit of knowledge, albeit she could safely bet that her pursuit was a little more in the ways of the magical arts than Twilights was. Whilst she didn't want Twi to feel overly crowded, she figured it might help her ease in to school life at CHS if there was a familiar face there to assist in the knowing about all things CHS...and since Pinkie didn't seem to be around to engage in the endeavours of friendly bantering, it seemed that the task of casual assisting guide fell upon the shoulders of one Sunset Shimmer to undertake! " Twili-... " Sunset opened her mouth to speak, but noticed that there was somebody who'd entered the fray whilst she had distracted herself with the task of packing her bag - the one known as Inkbrand. " Shoulda known somebody like him would get there first." She chuckles to herself as she continues her approach anyway, not particularly swayed by the turn of events...was all just a part of the task at hand, right? " I see you're already getting acquainted with some of the other folks here, Twi'... " She comments with a wry glance at Inkbrand. " Don't mind him...Inks harmless enough, although he does have his moments! " It was a playful jab, and one she was fairly sure he'd brush off pretty easily. if he wasn't made of stronger stuff then that was probably his own thing to work on...right now, however, Twilight was the one who likely needed the assist. She's cool and all but she can't hold a candle to my bunny magician waifu. Well, the dramatic entrance and subsequent pratfallings seemed not to have accrued any serious levels of injury, and whilst Sunst was tempted to address watermelon and see if she was okay, it seemed as though she'd been beaten to the punch on that by one of the transfers, who had but a few moments ago was in the middle of an introduction to herself. Naturally, when things had transpired and the crashing event took place, Sunset hadn't exactly gotten a chance to make a response and shake the offered hand - she had no reason not to in the surroundings, even if there was something a little off about it's owner. Well, whatever...in all honesty, she knew there was nothing to really base those initial uneasy feelings on - Starlights overfriendliness could just have been a desire to not show herself up in front of CHS students, especially ones who had been no doubt been spoken of in more than mere passing. Sunset simply inwardly shrugged and put her thoughts down as a simple case of kneejerk reaction to new faces...that was something she'd still have to work on and she was now clearly made more aware of that than ever. Her thoughts dissipate when Inkbrands irreverent sense of playfulness punched through her brief pondering, and she simply gives a small chuckle - yeah, he was pretty on the nose about the fact that there would inevitably be plenty of injuries and unfortunate trips through the rest of the semester...unlucky though Watermelons fall was, it was a reminder to keep your wits about you and to turn down the rushing on campus. " Well, I'm just glad it's nothing too serious... " she says finally, exhaling sharply. " The last thing orientation meetings need is somebody breaking something more serious than an anxious sweat! " Ace Attorney 6 demo on the 25th of August....awwwww yus! Well...it seemed like things were KIND of going okay? Sunset wasn't exactly *certain* on how everything was really going with the orientation overall right now, but if there wasn't immediately something making with bad vibes then, she figured, everything was kinda going smoothly enough to the point where she could at least relax a little more...although it seemed as though the little tete-a-tete between Inkbrand and Blueblood was seemingly becoming a whole lot of 'male bonding' - but as long as it didn't spill out into the surroundings then there were no massive causes for concern there. She found her attention caught by the mentioning of her name out loud - she paused and glanced over in Valens direction, noting the hand outstretched...and caught unawares, a whole beat of a moment passed before she realised that he was awaiting a handshake, which she quickly made to attend to upon the realisation. " Uh...yeah, that'd be, uh, me... " she responds with a nod as her thoughts caught up with her. " Nice to meet you...and you are? " Before the answer to that question could be given, however, Watermelons dramatic entrance took place...distracting many in the immediate vicinity as the unfortunate student and Wooden bleachers got quite noisily acquainted in full view of everyone present - and ouch, that did NOT look like a fun time was being had. " Oh geez - that looked painful! " Sunset winced, remarking as the scene transpired before her eyes. " looks like we have our first casualty of the year! " You know it's nice and all, but I am still peeved that Investigations 2 didn't got western release. Fan patches don't count. It'll have to count, Ciraxis - Capcom don't seem likely to overtun that decision, ever. Well at least it HAS a complete patch. For a game that contains so many walls of text that's really something. Many other titles can't say the same (Super Robot Wars for example. We FINALLY getting a full english release in V. Still had to import it but it's really something after $%^&@#* 25 YEARS!). If there are games that I am surprised that were released in english in first place, I would had to point at recent JoJo Bizarre Adventure games. You screw with my everything anyway, might as well just toss my chips into the pile because I'm stupidly silly that way! A new year, a new potential host of interesting challenges and memories to be made - hopefully, Sunset thought to herself, there would be less 'challenges' of the magic variety to worry about this year than she had encountered in more recent times...which, when she looks back at it now, was a thought that she wouldn't have entertained even in the slightest a few years ago. There was once a time that Sunset Shimmer would have embraced and thrived in a situation charged to the nines with magic and sorcery, but given how trouble much it had brought upon the denizens of CHS...yeah, it was a much better time when things were just a little less unpredictable. Shaking her head free of the pondering thoughts, she returned her attention to the here and now where the throngs of newly inducted Ex Crystal Prep students were awaiting the instructions for the day ahead, and in due enough time a small tour of the essential places of Canterlot Highschool itself - 'the grand tour', Sunset chuckled to herself lightly, always a highlight for new students. As ever, Sunset had joined the list of those willing to assist with such an endeavour - although now it was because she truly desired to offer assistance, as the lingering tendrils of the doubts of her misdeeds were finally coming away...her efforts to atone for her transgressions seemingly bearing some major fruit in the last few months, most certainly aided by her very public assistances with the defeating of occasional evils. Still, it promised to be a pretty interesting group and she was definitely looking forward to lending some assistance where it was required...although for now it was just her, since the others seemed to be a tad busy and Twilight, the Pony Princess and not the raging but adorable Scientist, seemed to be altogether unavailable to lend a helping hoof/hand. That wasn't really a big deal, although it would probably have been appreciated - Sunset was more than capable of handling her part in this scenario without assistance, and thus planned on participating by putting on a perfectly passable performance. And so, she delved into the fray to see just what was up...and to lend some help if indeed it was required for her to do so...taking care to politely greet the late arrival as she passes by! Robikku Pegasus wasn't usually one to go to the gala, he'd been to one a while back and honestly hadn't had the WORST time...but it was more a case that he was either busy or just generally unavailable to make time to get there - well that wasn't strictly TRUE, but he liked trying to be available in case something actually did come up whilst he was out of the office. Of course, he had admitted to himself a while ago, that didn't really happen quite as often as he liked and the chances of that happening during THIS years gala was probably as likely as the ones before...which only gave him reason to go see if, instead of waiting, he could go and establish a few connections and clients during this years gala instead. To be honest, He probably should have done that after the first time he'd attended, but he had convinced himself that he could make it work...a little bit of young foolish pride, the lawyer supposed. At any rate, here he was...among the many in the lounge - the elegant surroundings playing home to quite fantastic decor and interesting foods as well as the rich, not so rich, and other assorted figures of varying levels in Equestrias rich landscape of equine folks. The pegasus, dressed in a decently pressed suit and tie, was in the throngs of the crowd and pressing forward to just relax in the vibrant atmosphere with the rather pleasant music and general buzz of the visiting ponies, all here to socialise and engage in social pleasantries in Canterlots palace, home of the two sisters who kept the nation of Equestria alive and well...and whilst not all citizens would always agree about how their rule plays out, at least in a shared space like this there was mutual respect regardless of personal stances. As he stood there, eating from a small selection of foods on his plate, Robikku cast a glance around him and observed those who were here in discussion and calm relaxation mode...at least this was a much more enjoyable situation than being in court, where there were no enjoyable treats on a table or musical interludes - just the prospect of hard work on behalf of a client. As much as Robikku enjoyed the thrill of engagement in the battle of guilty and innocent, it was times like this that he was glad to at least be able to put full thoughts of work aside and just enjoy a social treat that didn't really come around all too often. Best to enjoy the chance for some time off while it was available, afterall! "This is awesome! What kind of moves do you got Vinyl?" The movement of the room, the musical rhythmic pounding of the hard-hitting bassline, and the intensity of the dancefloor was always a good place to be in the middle of a club, especially one as popular as the electric mane...Vinyl knew this better than anyone, and right now in the heat of the moment with the rainbow-maned pegasus in front of her, she was kinda startin' to feel the familiar rush of a good evening ahead. It wasn't often the mare had a chance to socialise with a mare she respected, or perhaps even admired, like this so she was all for a good chance to chill and let her own two-toned mane down whilst others kicked it up into high gear around her. Even on what would be a night off, Equestrias best DJ was hard at work with the goal of entertainment...although this time around, it wasn't a whole crowd of ponies she was aiming her attention at. " Well, I was never big on the dancin', but I probably got a few moves here and there... " she says with quick flash of a smirk, running a hoof through her mane. " What kinda party pony comes unprepared to her OWN gigs, right? " Truth be told, Vinyl wasn't the best PREPARED 'dancer', but she was never afraid to have fun in front of others...there was no harm in lettin' the mane down and just going with whatever way the wind was blowing...and since today, the wind was blowing in the ways of makin' a derp of herself in front of the crowd, that was just how things were gonna go. Tapping her feet to the rhythm, she took a deep breath an' got to work with a quick quirky shuffling of each hoof...throwing her head back every so often as she got into the swing, circling her way around Rainbow before gettin' on hind legs in an upward stretch....clappin' forehooves 1, 2, 3 times before spinning on one hindleg and catching herself on all fours - muzzle conveniantly nestled against Rainbows ear as she chuckles and speaks in a playful whisper. " Your turn, Hotshot! "